In a Statement Heard 'Round the World (of Final Fantasy fans), Square-Enix boss Yoichi Wada has said that Final Fantasy XIII may truly be the Final Fantasy - at least, as we know it. Final Fantasy XIII is big - really big. Not only has its reception been big - selling 1.5 million copies in Japan in less than a week, but its development was big... or rather, long: The last numbered Final Fantasy came out in 2006. Speaking with Edge, Squeenix big shot Yoichi "Imperial Hot" Wada said that even with the huge success of FF13, it might be time for the developers to move on in a way. I believe Final Fantasy XIII is going be something special, and that it's going to be well received by the audience. But whether we are going to continue to internally create this type of game remains to be seen, because I actually feel that the team that was involved with Final Fantasy XIII should next move on to create and generate some 'next generation' forms of play. Internally and externally I feel there's an expectation of Square Enix to offer something new, and I really think that the Final Fantasy team could create something completely different, but at the moment they're strictly catering to the particular audience they have now. But what, exactly, does that mean? 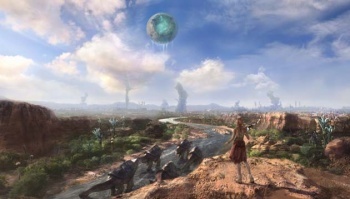 It's a very vague statement from Wada, to be honest, because "next generation" forms of play could mean just about anything - and both Final Fantasy XIII and its immediate predecessor have been moving away from the standard "run around, load screen, random turn-based battle" model that the series was traditionally known for. Would the developers be moving into less linear modes of storytelling? Would they be looking to embrace more Western principles of gamemaking thanks to the acquisition of Eidos? It certainly doesn't mean that the Final Fantasy series is over (at least not with Final Fantasy XIV right around the corner), but one thing is certain: FF fanboys and fangirls are probably freaking out right about now. For the full interview with Wada - in which he discusses his favorite games like Myst and how the integration with Eidos is going - head on over to Edge.